Victoria-based boat security and monitoring product has recently been named as Pacific Yachting’s “Most Innovative” product at the Vancouver Boat International Show. 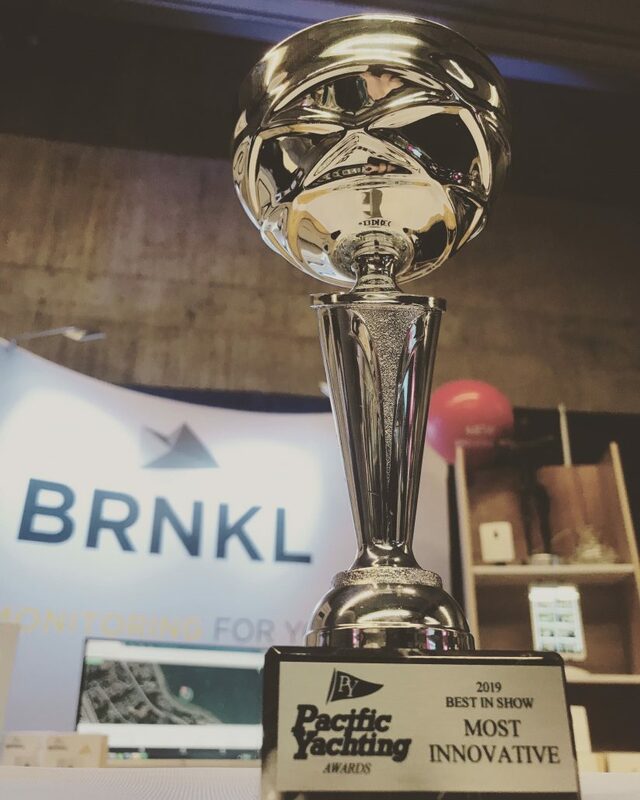 Victoria BC – February 27, 2019 – Barnacle Systems Inc. (www.BRNKL.io) has reinvented how people check on their boats. Their product, BRNKL (pronounced barnacle), is like a “home security system for your boat” allowing users to check in on their vessel remotely from their smartphone, tablet, or computer. Based in Victoria, BC, and founded in July of 2017, Barnacle Systems has recently been recognized as Pacific Yachting’s “Most Innovative” product at the Vancouver Boat Show. “This is a very special award for our team,” explains Barnacle Systems Founder, Brandon Wright. “Pacific Yachting had us competing against giants such as Garmin and Raymarine. Being compared to such large companies this early-on is an honour and coming home with the award is a dream.” Barnacle System’s unique ‘Impact Monitoring’ technology was a focal point of the award; this impact technology allows boaters to understand if someone has bumped into their vessel at the dock or if their boat’s bouncing against a dock during a storm. The impact monitoring is also useful to charter companies that would like to know whether a vessel has run aground during a charter rental. The team at Barnacle Systems is continuing to develop additional market-leading features on their security and monitoring product that will continue to reinvent how people check on their boats. Pacific Yachting is Canada’s best-selling boating magazine and has been serving the recreational boating community for over 43 years. Power or sail, Pacific Yachting helps you get more from your time on the water with high-quality and up to date content on a variety of topics. Each month, read the latest information on cruising destinations, news issues, local attractions, upcoming events, do it yourself projects, fishing spots and more. Plus every issue brings boat reviews, boat care and the latest in new gear and technology. From the best anchorages to the best pub Pacific Yachting knows the Pacific Northwest coast.